“There’s definitely more upside potential than downside on cobalt,” says Rawles. He sees cobalt prices performing strongly this year. Cobalt prices are on the rise, supported by a boom in the electric vehicle (EV) space. But will the cobalt market continue to perform well in 2017? And what should investors be watching out for in the next few months? To get more insight on the critical metal, the Investing News Network (INN) caught up with Caspar Rawles, analyst at Benchmark Mineral Intelligence, before the Vancouver stop of this year’s Benchmark World Tour. Watch the video above for the full interview or read the transcript below. Don’t forget to follow us @INN_Resource for real-time news updates. You can also follow Rawles at @CDMRawles and Benchmark Mineral Intelligence at @benchmarkmin. INN: Cobalt prices have been surging since last year, partially due to increasing demand for EVs. Will this sector continue to drive demand in 2017? CR: Yes, definitely. This is something I’ve been looking at recently, and all the growth in the cobalt market will be from EVs pretty much. There’ll be some growth in other industries, but it’s largely going to be down to EVs. To put that into numbers, in 2016 megafactory demand for cobalt was about 46,000 tonnes. By 2020 that’s going to be 76,000 tonnes, so there’s going to be a lot of growth in the coming years. INN: Tesla (NASDAQ:TSLA) gets a lot of attention in the EV space. But should investors be paying more attention to Chinese lithium-ion battery megafactories? CR: Yes, definitely. We track the megafactories, it’s something that we do at Benchmark, and as you say, Tesla gets a lot of the media attention. But really the growth story is in China. We track a total of 15 megafactories globally, which are either currently producing or are due to be producing material by 2020, and nine of the 15 are in China. So that’s really where the growth from industry is going to be. INN: In terms of supply, we know that more than half of the world’s cobalt comes from the DRC, which is a politically unstable country. Do you see Canada or any other more stable country being able to boost production in the near term? CR: I think there are certainly some projects which can add to the supply in Canada and in Australia as well — those are the ones that stick out. But really in terms of the large supply that the industry needs, that’s going to have to come from the DRC. There’s no lithium-ion industry without DRC cobalt. INN: What other factors could affect the cobalt market this year? CR: There are a couple of things going on. There are some concerns over potential supply of the metal from some of the projects globally. That is a potential point of concern. Other than that, it’s really a case of how quickly the EV production picks up going into the future. INN: Overall do you expect a cobalt deficit in 2017 or is that still to come? CR: That’s still to come. The market’s going to be very tight certainly to 2020, and in about 2020 to 2021 that’s when we start seeing some deficit in the market. There are a couple of large projects that are due to come online prior to 2020, obviously Glencore’s (LSE:GLEN) Katanga being one and Eurasian Natural Resources’ (LSE:ENRC) RTR project. In the near term, quite a lot of supply will come into the market, but after that we start seeing potentially a deficit coming in. INN: What about prices? What is your price prediction for 2017? CR: Prices are going to perform strongly. There’s definitely more upside potential than downside on cobalt. In the immediate term, there could be some small amount of the price coming off, but it’s not going to be meaningful, it’s just to do with the amount of stock was being sold particularly in the Far East. Really it’s just upside potential, we don’t see any meaningful decrease in prices. INN: And finally, some analysts are saying that this year cobalt is a better play than lithium. What is your opinion? CR: Any mineral that’s involved in the lithium-ion battery space is something to watch, I would say. You could say that lithium had its boom price … and perhaps it won’t perform as well as it has done in the last 18 months to two years. So yes, cobalt is definitely one to watch, but just keep an eye on any mineral that is involved in lithium-ion batteries because that space is set to go hugely. 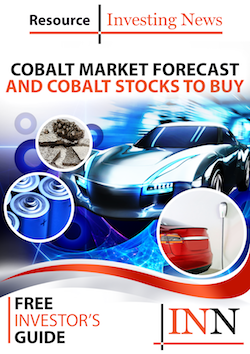 I notice the absence of a future USA cobalt producer–Ecobalt Solutions (ECSIF). Certainly, their safe-source location (Idaho), and eco clearance will make them a valuable producer by 2018. Relying on the DRC scares the heck out of me, whereas Canada and Australia are reliable sources. Everyone trying to get our investment support is offering a 2020 solution to a 2019 crisis. All the great auto companies have tasked their immense engineering departments to design an electric car -THESE TEAMS ARE NOT ALL GOING TO FAIL – some of these cars are going to hit the road with inferior batteries. long time investor in eCobalt Solutions.